Playwright Lucy Thurber is angry about the state of things in America today. As a result she has written an angry play about her feelings and given them to her heroine Sally Wright in The Insurgents, now having its New York premiere courtesy of Labyrinth Theater Company. Unfortunately, while her heart may be in the right place, and who would disagree with her about the state of things today, Thurber has not written a play so much as a series of rants which basically say the same thing: no one is doing anything to help the poor and disenfranchised who continue to lose their footing on a downward slope. While the audience is asked to sing a hymn of hope at the end of the evening (the words are provided in the program), the play has no ending and is totally lacking in hope. Sally Wright has returned to her New England mill town six years after an accident lost her sport scholarship at a prestigious eastern college that her working class family could not afford. Since then she has been wandering around the U.S. visiting cities in desperate trouble to see the state America is in for herself. She has just come from post-Katrina New Orleans and post-bankruptcy Detroit where she has been traumatized by her experiences. Back at her father’s house, she is deep in the throes of a nervous breakdown, reading up on her heroes, the revolutionaries Harriet Tubman, Nat Turner, John Brown and Timothy McVeigh, communing with them when her family is not around, and carrying with her at all times the rifle her father gave her and her late mother’s Bible. Her talks with her father and brother indicate that they are in as much trouble as working people elsewhere, worrying about “paying the mortgage food and bills.” They live in a town where the young people have no money, no employment and no education. Sally also has flashbacks of her time with her African American college coach and her boss in Detroit, both of whom give her good advice. The one unusual thing about the play is the use of four historical characters, “insurgents,” if you will, who put in appearances throughout the play and speak of their beliefs in statements that have since become famous. The problem with the play is that all of the characters are mouthpieces for various positions but not real people. And basically they all have the same message: the federal government doesn’t care about the rights of the working class who have to pull themselves up by their own initiative. Although the atmosphere and setting are authentic, a small town that has lost its mill and its jobs somewhere near Springfield, Massachusetts – similar to the milieu of Thurber’s epic five play cycle, The Hill Town Plays, seen in New York in 2013 – the characters are one-dimensional and all ultimately have the same story. While director Jackson Gay, who staged Thurber’s Where We’re Born and Scarcity in the 2013 cycle, keeps the play moving swiftly with the historic characters on stage at all times and who also join the modern story by a slight change of costumes, The Insurgents repeats itself endlessly. This would be forgivable if the play reached a catharsis but it has no answers. Ironically, The Hill Town Plays in which each of the five dramas had a real story to tell were much more persuasive about the current plight of the working class. 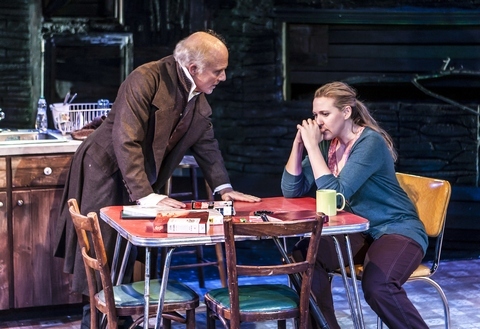 As Sally, Cassie Beck is onstage throughout the play but the playwright has not given her much reality other than her anger and confusion as to how the working class is being treated. 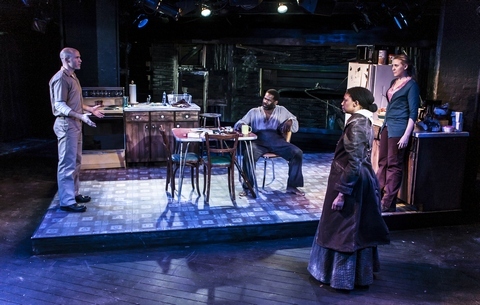 Dan Butler as both John Brown and her father Peter, Aaron Roman Weiner as Timothy McVeigh and her brother Jimmy, April Matthis as Harriet Tubman and her college coach, and Craig ‘muM’ Grant as Nat Turner and her Detroit boss Jonathan give impassioned performances. Unfortunately, they too are written as one-note spokespersons and ultimately they repeat themselves over and over. All of them have been given one extraordinary story from their experiences that may be why the author chose them in the first place. Raul Abrego’s kitchen setting, similar to several of those in The Hill Town Plays, is totally realistic, but leaving room for the flashback scenes to occur on a wide apron in front of it. Jessica Ford is responsible for the two appropriate sets of costumes, contemporary and historical. The lighting by Paul Whitaker is serviceable but does not make a distinction between day and late night scenes. Lucy Thurber’s The Insurgents is an interesting attempt to synthesize criticism of America today with that of historical and controversial personages from our troubled past, but in its current state the play is all rage and no resolution. It is not fair to put an audience through all this angst and then admit that the author has no answers. Riveting, ultimately chilling family drama of how we live now from the talented author of “Speech & Debate” starts slowly but packs a tremendous wallop. The Marx Brothers meet Monty Python in this inventive but exhausting version of Shakespeare’s problem comedy reset in the 1930’s by Elevator Repair Service.